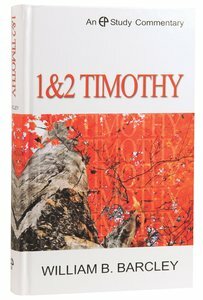 About "1&2 Timothy (Evangelical Press Study Commentary Series)"
If we were to take a poll of modern Christians and ask them what they think are some of the key issues facing the church today, what would be on that list? The questions of today are not all that different from the questions the church wrestled with in the middle of the first century. And the good news is, Scripture has answers to these questions. In particular, the apostle Paul deals with these issues as he writes his two letters to his friend and co-worker, Timothy. He may not treat them as exhaustively as we might like. He may not give specific answers to all of our modern questions. But he gives us guidance in wrestling with many of the problems and struggles that face the church today. Dr. William Barcley is Associate Professor of New Testament. Before coming to RTS, Dr. Barcley served for seventeen years at Gordon College where he taught a wide variety of classes. His primary area of teaching and research has been the Pauline Epistles.